US3 - Stop. Think. Run. The seventh album from producer Geoff Wilkinson's hip-hop-jazz crew Us3 sees the introduction of 2 new young MCs hot off the streets of New York. Underground hip-hop fans should already know the name of 23 year-old Sene, and spoken word aficionados will certainly be aware of 20 year-old Brook Yung. "These two cats are the youngest MCs I've featured on an Us3 album since Hand on the Torch", says Geoff, "and it's definitely upped the hip-hop quotient on this album". With sounds ranging from the straight-up beatbox track You Already Know & the crunk-influenced Turn It Up, to the lush piano & shuffling drums of The Love Of My Life & the tense urban paranoia of Gotta Get Out Of Here, Us3 paint a wide picture of sounds. A strong latin influence is prevalent in the vibes led party track Can I Get It?, the seductive horns of I Let 'Em Know and the grooving wurlitzer bossa dance of She's With Me. The tricky time signature changes in Who Got Next? have Sene effortlessly wrapping his twisting lyrical wordplay around a funky 4/4/3/4 groove. Collaborators from the jazz side include the familiar notable faces of Ed Jones (sax), Bryan Corbett (trumpet), Chris Storr (trumpet), and John Crawford (piano), while top turntablist DJ First Rate scratches up a storm. The 8-piece Us3 live band will be supporting the release with a 21 date European club tour in April, with appearances at festivals throughout summer. Us3 is the brainchild of London-based producer Geoff Wilkinson. Formed in 1992, alongside production partner Mel Simpson, Us3 rose from the ashes of 2 previous incarnations. The first was a limited edition white label 12" release in 1990 called "Where Will We Be In The 21st Century" featuring rapper MC Honey B and jazz pianist Jessica Lauren. This brought the attention of a (then) fledgling indie label, Ninjatune, and the result was NW1's 1991 12" "The Band Played The Boogie". By sampling one of the biggest dancefloor tunes of the burgeoning jazz dance scene, Geoff had unknowingly started a chain reaction. The tune he sampled was Grant Green's "Sookie Sookie", originally released on Blue Note Records. London's Kiss FM playlisted "The Band Played The Boogie" and Geoff received a call summoning him to EMI's offices in London. Knowing the sample had not been cleared Geoff was nervous, but somehow talked himself out of being sued and into the Blue Note vaults. By allowing complete access to their legendary back catalogue, Blue Note went back to the future. "It was a brave decision by Bruce Lundvall (Blue Note President)", says Geoff, "but he made me record some demos first, to prove I could do it". One of those demos, recorded in March 1992, was "Cantaloop (Flip Fantasia)". Exactly two years later it was sitting in the US top ten. The resulting album "Hand on the Torch" subsequently become a global phenomenon. It was the first Blue Note album ever to achieve Platinum status (1,000,000 sales) in the USA. The worldwide success of Us3 took everyone by surprise, and proved a point to Geoff. "I always thought there was a huge potential audience for jazz amongst younger people, and I wanted Us3 to be a point of access for them. By sampling classic jazz tracks, mixing them with beats and raps, and having younger jazz cats playing on top I was acknowledging the past, staying rooted in the present, and looking forward to the future, all at the same time." After several world tours with the Us3 band, Mel left for pastures new, and in 1996 Geoff set about making the follow-up. "It was always my intention to change the vocalists with each Us3 album" says Geoff, "it keeps things fresh and exciting for me too." NY rappers KCB and Shabaam Sahdeeq came in to replace Rahsaan Kelly, Kobie Powell & Tukka Yoot, and the resulting 1997 album was "Broadway & 52nd". The Blue Note samples became more embedded in the grooves and experimental tracks like "Snakes" (in 5/4) and "Sheep" (a spoken word poem) broke new ground, drawing great performances from K and Shabaam. A frustrating period signed to Sony in NY was eventually brought to an end and the third Us3 album "An Ordinary Day In An Unusual Place" was released in 2001 by Toshiba EMI in Japan, and Universal in Europe. The album itself represented a quantum leap in the Us3 sound. Alison's vocals oozed soul and musically Geoff had incorporated elements of drum'n'bass, Latin, and Indian music into the mix. "I've always had a very wide ranging taste in music and this was my chance to show it", explains Geoff. "I also wanted to do something more overtly political, and Alison & Mich have both written some great socio-economic observations". Several European and Japanese tours took place throughout 2002, and the crowd reactions were incredible. The 4th Us3 album "Questions" was released in Japan in 2003. This time Geoff ditched the samples completely and made an album heavily influenced by both his love of Latin music and the neo-soul movement. Brooklyn rapper Reggi Wyns and London-based (South Africa-born) female singer Mpho Skeef were the featured vocalists. Says Geoff, "there's been a decreasing reliance on samples with each Us3 album, and "Questions" is the culmination of that. And it was nice working with some live musicians rather than dead ones!". "Questions" was also the first Us3 album to be released independently (outside Japan). Two tours of Europe throughout 2005 saw the Us3 live band perform 50 gigs in 14 countries, serving as a huge inspiration for Geoff. "The gigs in 2005 were awesome," says Geoff, "and I decided to make a much more vibey, uptempo live-sounding album next". The result was the multiple musical personalities of "Schizophonic". All members of the Us3 live band were featured, including the blistering trumpet of Chris Storr, the soaring sax of Ed Jones, the funky muscle of double bass player "Level" Neville Malcolm, and the unique turntable mastery of DJ First Rate. "Schizophonic" also featured two new rappers, Akil Dasan and Gaston, both of whom Geoff found at New York's legendary Nuyorican Poets Café. Akil's rhythmical mastery was put to the test on a variety of beats ranging from straight-up hip-hop to Brazilian sambas to straight-ahead jazz breaks, while Gaston's intricate twisting wordplay will have you laughing hard, scratching your head, and snapping your neck all in the same breath. 2006 also saw the Us3 band gigging in Russia for the first time. The 2007 album "Say What!?" saw Geoff doing something he's never done before. Rappers Akil Dasan & Gaston made a reappearance. "I normally like to change the vocalists on every Us3 album," says Geoff, "but Akil & Gaston did such a great job on Schizophonic I wanted to develop our relationship further. I think they've both stepped up a gear on Say What!?". With the addition of vocalist Adeline, the Us3 sound took on a contemporary R&B twist, typified by the powerful single "Say You Belong To Me". Yet again the album had a huge palette of sounds ranging from the big crunchy drums & horns of "VIP" and "Intoxicated" to the synthesized string drenched jazz breaks of "Afrodisiac" to the seductive Brazilian grooves of "How ‘Bout It Baby". 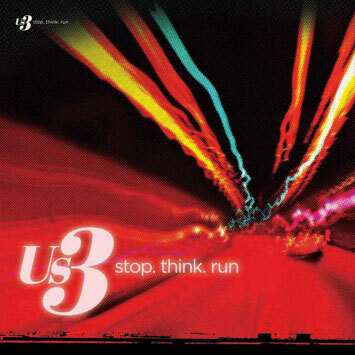 After taking a break from touring in 2008, Us3 are back in 2009 with a new album "stop. think. run" featuring 2 new American rappers, 23 year old Sene and 20 year old Brook Yung. "These are the youngest vocalists I've featured since the guys on "Hand on the Torch" says Geoff, "and it's definitely given the album more of a hip-hop bite". From the gritty opener "Gotta Get Out Of Here" to the bossa nova club track "She's With Me", the album touches on tales of urban paranoia and desperation to the pursuit of true romance. On the musical side Geoff employs some familiar Us3 faces in the shape of saxophonist Ed Jones, trumpet players Bryan Corbett and Chris Storr, along with a dazzling array of London's finest keyboard players. The turntable skills of DJ First Rate are also to the fore. Perhaps the most surprising tracks are those that feature a more stripped down production approach. "You Already Know" is completely made of vocal samples, and "Turn It Up" utilizes only drums and synthesized bleeps (jazz crunk?). The hard electronics of "The Future Ain't What It Once Was" and moody piano-led "Got To Make A Livin'" resonate with the current economic situation, and the gorgeous tale of attraction in "The Love Of My Life" ensure that everyone will relate to this. Geoff sums up the album title: "In life sometimes you need to stop and think about what you are doing and what you really want to do. And when you've identified what that is, run towards it". The 8-piece live Us3 band will be touring throughout 2009. Tour Dates..... Please consider South Africa!! !